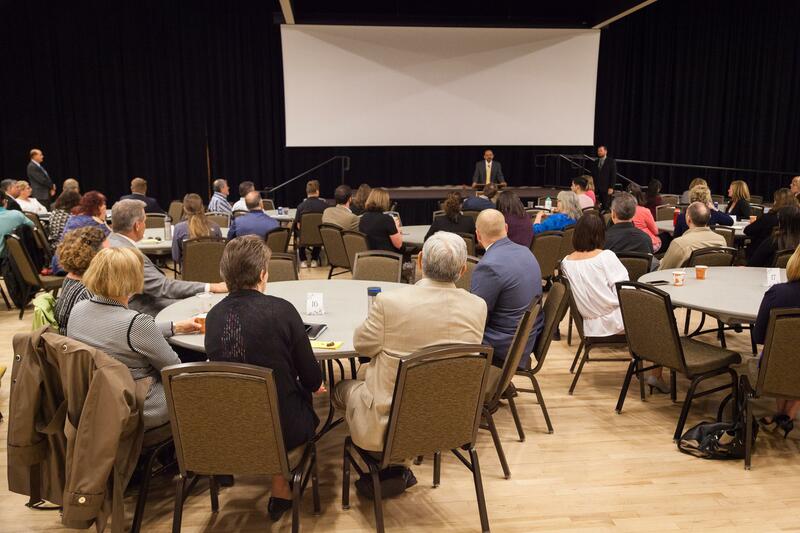 “We’re all on the same team – administrators, faculty, staff, students, alumni – we’re all trying to make a difference here,” UCCS Chancellor Venkat Reddy said during opening remarks of the Chancellor’s Town Hall April 23 in Berger Hall. Teamwork was the focus of the town hall in collaborating with University Advancement and colleges, departments and units across campus. A video, Jeopardy game and tabletop information sessions provided more than 150 faculty and staff members an opportunity to learn more about University Advancement. Representatives from Development, Marketing Communications, Alumni Relations, Special Events, Partnerships and Public Policy, and Strategic Military Initiatives split up among 20 tables during the activities. Echoing the Chancellor’s remarks, Martin Wood, senior vice chancellor, University Advancement, invited the campus to connect and partner with advancement in working toward the mission and goals of the university. “If you know a donor – connect them to the development folks. If you have a great story – connect them to marketing communications folks. If you have an alumnus who’s really reached a peak but is under the radar – tell the alumni folks,” Reddy said. Informational activities were followed by prizes for the winning Jeopardy team and pizza for all. Learn more about the University Advancement team.